Scrum is an iterative framework that is far more simple and easy to manage change in a software development or you can say web development. Scrum methodology sounds quite confusing but the fact is that it makes change management more organized with less effort. Scrum is a software or web development strategy in which a team works in collaboration to meet challenges and fulfill the goals set by client. It focuses on physical co-location and close coordination of team members working over a web development project. Scrum is not about just project delivery but it is a process of incorporating change at every step of a website development or software development. Being an agile development process, scrum methodology requires change management. What is change management in scrum? Scrum methodology involves agile development process that focuses on managing change with approval of several people involved in a project. Change management is to ensure modification of a software by consent of all members. The change management in scrum is the revision of requirements set by client that may include adding new requirements or modifying the existing ones, to deal with other type of development during scrum process, fixing defects, collaboration with other team or working over different strategies to ensure an effective project development. This project management process typically includes a detailed change request form to be filled. This form is based on filling the attributes such as detail of the change required, its impact on the project, risks to be measured and mitigations. Also, the traditional change requires approval of so many people involved in the project. 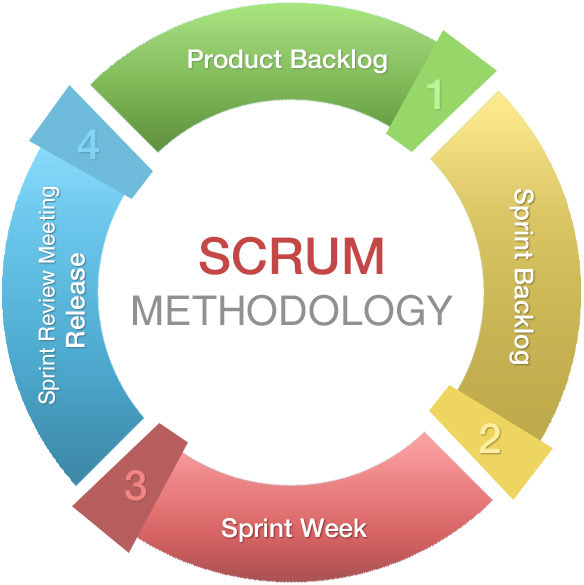 However, scrum methodology works on the principle of responding to change over following a plan, it works when there are so many forms to be filled and list of approvals required by web developers. Disciplined Agile Delivery (DAD) process framework is a carefully constructed mechanism that streamlines software and web developers to encounter any type of situation ranging from simple to complex. For dealing with change management, web developers are needed to consider options such as devised strategies and using traditional realm. The formal approach to change management includes properly defined work in detail with all changes to be made. These changes are agreed and managed throughout the web development process. The product owner is responsible for working on change requests and team lead is responsible for processing the requests from other team members. Scrum product backlog is a common agile approach to change management. It has so many advantages for being simple and easy to understand. It includes a product backlog in which requirements and other defect reports are managed as an ordered queue. This backlog comprises of features, bugs, technical work and knowledge acquisition. A work item stack or work item queue is an extension to the Scrum’s product backlog. It includes items such as requirements, defects, team collaboration requests, and personal requests that are prioritized on a variety of considerations such as businessmen interests and team health considerations. This is also advantageous for managing change in a single and consistent manner and for providing an explicit strategy for high-risk work that ensures increased chance of project success. It manages change in web development by considering work item pools. It recognizes different ways to prioritize these work items. Any team member can place work items in the pool to work on that and the entire team is responsible for work from the work item pool. The main benefit of this approach is that it is flexible to address prioritization schemes. For change management there is an open choice to follow any strategy for small and simple projects. It does not involve prioritizing a work and there is nobody prioritizing anything. It is best suited for low value work of an agile team. Scrum methodology helps for change management during a web development project. eTek Studio brings Scrum methodology for web development Dubai to ensure satisfied development of a website or software of its clients.